4-1-16 –Your landscape should hold secrets – mysterious, captivating, alluring secrets. Lots of them. Designing a landscape that does not tip its hand in a glance – not by a long shot – should be a goal kept foremost in mind as you plan. Your goal is to create mystery. Mystery in the landscape is created when objects – dense evergreen trees and shrubs, hedges, hardscape walls and structures such as gazebos, potting sheds, interior fences, or the house itself, block one’s view of what’s on the other side, around the corner, or over there. In a nutshell, you’re simply using taller materials in one portion of the landscape to block the view to a different portion of the landscape. It isn’t difficult. Your house sits somewhere on the property, most often near the center, dividing your lot into four yards – front, back and two sides. A visitor can gauge nothing of the back yard while standing near the house in the front, and vice-versa. Bereft of plants and filled solely with lawn, only the side yards offer a view of a portion of either front or back yard. Let’s start there. You really want to walk that pathway to see where it leads, don’t you? 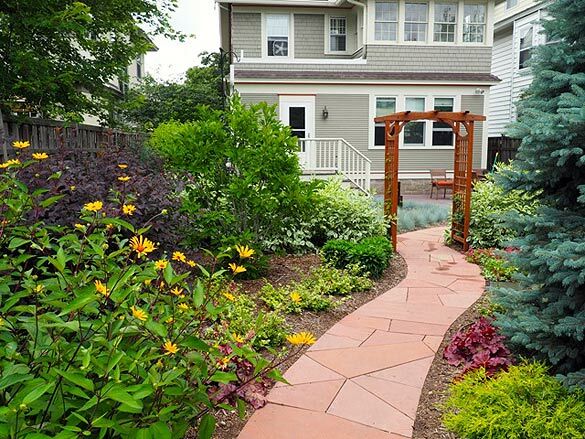 A pathway through the side yard that connects front to back is the perfect spot for an arbor. Arbor placement is simple. 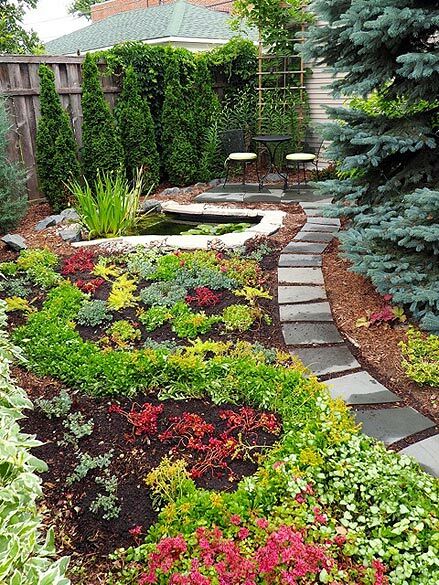 Pull the foundation planting bed out away from the house, either at the front of the side yard, one-third in from the front, or the middle. Opposite the foundation bed, pull the perimeter (property line) landscape bed toward the house to a point where the two beds are separated by only four feet. That’s where you place your (typically four-foot wide) arbor, with the pathway running through it from front yard to back. Tall shrubs leading to the arbor on each side create an attractive wall, so that the arbor acts as both doorway and window. But hold on a minute. What does one see when approaching the arbor while walking the grass, shredded bark, gravel, brick, or steppingstone pathway from the front of the property to the rear? If the pathway is straight, running basically parallel to the side of the house, on the entire journey one will be looking at a fair portion of the back yard ahead. Except one hasn’t yet arrived in the back yard. That will never do. Curve the pathway as it passes through the arbor, perhaps curve it back the other way once past, then plant trees, tall shrubs, or place/build sections of lattice wall (adorned by climbing plants) so that one’s view from front to back is blocked. One has to stay on the pathway and get around the curve(s) ahead before the view to the back yard is announced. 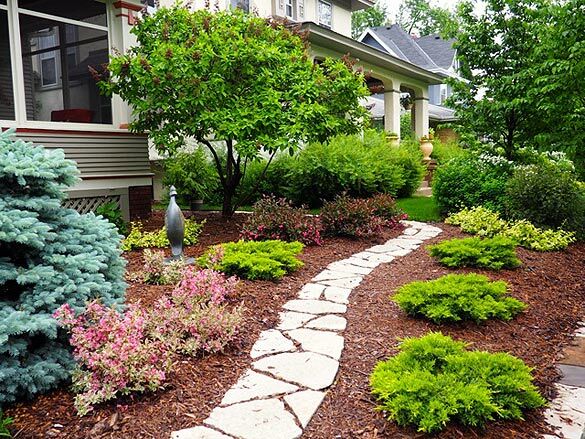 Front yards tend to be an open book, particularly if a majority of the space is lawn. It’s not a bad thing; after all, a fine goal is to present your attractive house, the foundation properly nestled by shrubs and small trees, in the view from the street. Grass lawns in the front yard allow for this, although the scene will be far more pleasant if the lawn is shaped like a pond or putting green. The glimpse of an arbor, the start of a pathway that disappears around the corner and leads to wonders unknown, adds mystery. 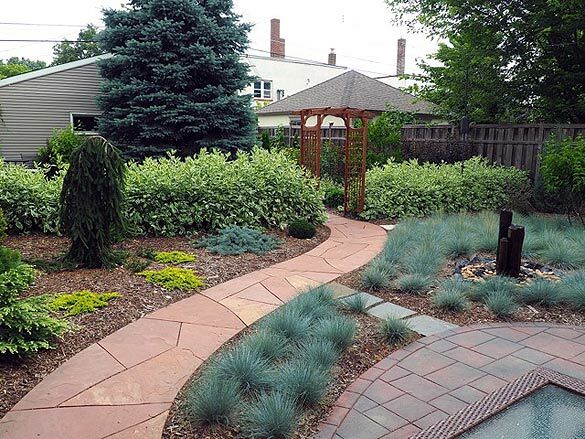 In this back yard renovation, one enters the area from the side yard, and is treated to the small conifer garden on the left. 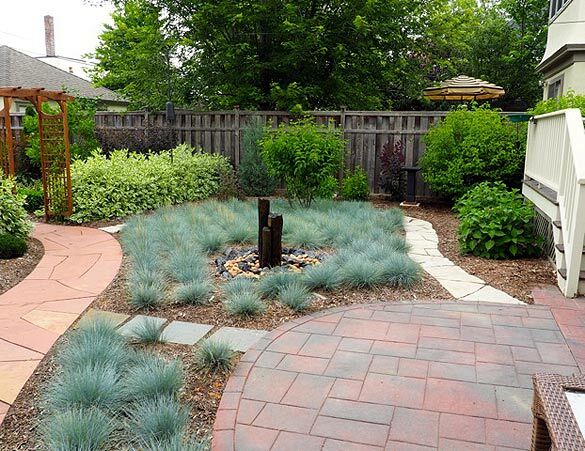 Back yards tend to be where the most intrigue can be introduced. 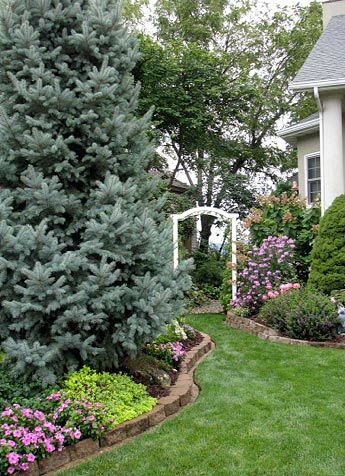 Evergreen trees create natural walls, as do upright evergreen and deciduous shrubs. Hedges made from these plant materials that curve (or, in formal design, run in a straight line) can be used to screen and divide portions of the landscape so that the secret on the other side of the hedge – a small private patio, pond, sculpture, or boulder fountain with bench – is unveiled in a manner that brings surprise and delight. One also can see all of the large second room on the right. But note the Dogwood hedge curving across the middle of the yard – now three years old, it’s growing tall enough to block what’s beyond. Walls of stone, brick, wood or other manmade materials serve the same function. Remember that these walls (in addition to hedge and screening plants) need to be five feet or higher to perform their function of blocking the view until one navigates the course around them. Only after passing through the arbor and looking to the left does one see the lily pond and private seating area. Surprise! And of course, this trick works in reverse. Entering from the back gate (or detached garage), one can see the shrub and perennial setting to the left, can’t see the pond/seating area because of the large spruce, gets a glimpse of what lies ahead past the arbor, but receives not a hint of the conifer garden. Creativity may lead you to break this height rule. One of the most surprising views I’ve seen in a garden was while walking a pathway edged by a three-foot-tall hedge of shrub roses on my right. Running parallel to this hedge about four feet further on the right was a rustic wood fence on the property line. Mounted a few feet from the bottom of the fence was a long, horizontal mirror, angled slightly outward from the top. As one looked over the hedge and into the mirror, one saw a miniature fairy garden planted along the backside of the rose hedge that could be seen only in the mirror. Magical!